Taking a beer bath does not mean that you will bathe in 100% beer and get tipsy as if from a glass of strong beer. This procedure is intended for recovery and restoration of skin beauty. Components present in naturally brewed beer, also known as a by-product of beer production, are added to the bath water since they have been known and used as curatives for centuries. It is well known that barley, hops, malt and brewing yeasts are necessary for production of beer alongside other different spicy plants, which are products created by Mother Nature. One of the fantastic objects of which many only dreamed about and which now everyone can enjoy, is a vat made of natural wood into which you can immerse yourself and enjoy not only healthy 34-35°C warm bath water containing valuable components from which beer is made, but also the exquisite beer aroma, beer foam and bubbles which simultaneously massage, help all vitamins and other valuable components absorb into the skin and, certainly, create a cheerful mood. To strengthen the cheerful mood and enjoyment while resting in a warm bath, you just have to reach out sideways to fill and then drink several glasses of cool thirst quenching beer. This way, health, vital energy and everything good present in beer will have effects on the body not only on the outside, but also on the inside. All raw materials for the preparation of beer as well as the unique tasty and natural beer itself are supplied and entrusted to us by real beer experts, producers and lovers – Valmiermuiža. As soon as you have absorbed all the best that beer contains and have felt yourselves completely happy (it takes 20 minutes), you will be wrapped up in organic cotton sheets and taken to a straw bed to have a 30-40 min long rest being surrounded by these "breathing" and medicinal materials and to fantastically relax listening to low-key music, to forget about everything in the world except what you have recently experienced and will never be able to forget; at this time, your warmed body keeps producing perspiration simultaneously making use of all components absorbed through the skin while you were taking a bath. The heart rate that increased while you were soaking in a bath returns to normal at this stage, too. 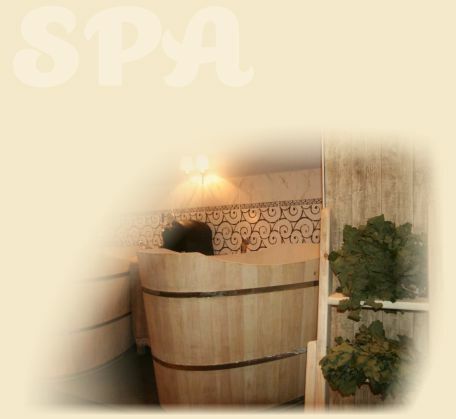 We recommend these baths to everyone, since in addition to every single good thing influencing your body and happening to your health while taking a bath, you will also obtain a fair dose of cheerful mood, optimism and a feeling that everything in this world sparkles, bubbles and smells nice just like in the beer bath. The total duration of this procedure is 1 hour (20 minutes of soaking in the bath and sensations + 40 minutes of leisure in a "breathing" straw bed). You may enjoy this adventure alone, together with a friend or in a company of friends. One vat is calculated for 2 people, and since there are two vats, the maximum quantity of people in one company for this type of leisure is 4.